So you have decided to start working out . Congratulations , on choosing to live a healthy lifestyle. If you can commit to a physical activity just 30 min a day you can feel better, loose weight and help relive stress. Please follow a healthy women’s fitness plan weekly. Women’s Fitness, In the previous article woman’s stretching we discussed a simple stretching routine with combine breathing techniques. Now it’s time to get physical …Remember if you are trying to get back into working out and enjoying fitness you need to start slow and build a scheduled routine. It’s important to do that you do not burn yourself out or obtain an injury. You need to create time for daily physical activities to maintain a healthy lifestyle. There are many times we get caught up forcing our self’s to run, or go to the gym when there are many activates that are fun and just as affective. Below there is an activity chart that will help with guiding you towards resources locally and or from your home. You can also get started with an affordable one on one trainer by contacting Burlington Cross Training. A personal trainer is an effective way to stay motivated and self assured that you’re doing things the right way. If you are just interested in a few classes it’s also a great way to get started working out and build your self esteem. Lets get physical just 30 minutes a day. Enjoy our Women’s Beginner Fitness Plan. Women’s Fitness,Choose one of the following activities daily . The choice will depend on how much time you have that day . If you find it hard to make time then try to plan a week in advance. Once you start to enjoy your Women’s fitness activities you can move on to more concentrated workout programs. Walking Activities, If have a dog and you are an animal lover pets need exorcize to . 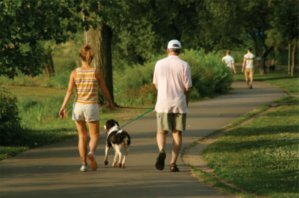 Walking or jogging your dog can be enjoyable for you and your pet. You can combine your physical activities with mans best friend. You can add this activity to your weekly and daily activities chart. There are many parks and trails you can discover that make walking more exciting. If you do not own pets you can still enjoy walking in parks or in the city . Discovering new places that you enjoy or make you feel good will help you stay excited about fitness. If you do not have 30 min to contribute that day you can break up the time in to 10 min increments. You can walk the dog in the morning or take a short walk when your going to get the mail. You can also do little things like taking the stairs or walking around a building or your home before you enter. Interactive Sports, Once you are conformable walking you can take it to the next step Biking, Roller Blading and even canoe or kayaking . These are things the whole family can enjoy . 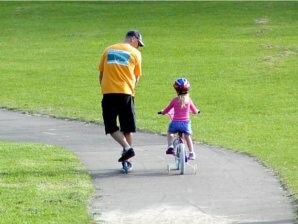 Its important to get the family involved so you can enjoy a healthier lifestyle together. Kayaking and canoeing can be a great way to get out of the house and enjoy fitness. There are also many local facilities and sports leagues that offer sports fitness like basketball, Tennis and Softball. Self Defense, Learning self defense is a chance to obtain a craft that will help you build confidence and real life skills. When you combine self defense sports like boxing or martial arts into your weekly fitness plan it is an opportunity to learn a valuable skill and enjoy fitness. Burlington Cross Training which is located in Burlington NC , offers one on one training in both( MMA )Mixed Martial Arts and cross training fitness. You can contact BCT to get started right away. There are many activities to choose from find the sports or activities that you enjoy and combine them with your weekly fitness plan. Being active is a life style change that is important to our health and happiness. When you combine physical activity and balanced nutrition as a part of your life style you have a better chance of fighting against heart disease, Cancer and diabetes. Which are the many causes of death every year. Exercise and nutrition are the most important steps to a healthy life. Women’s Fitness Plan by Burlington Cross Training.